Many of you may know his story. For those who don’t, it is a story worth knowing. 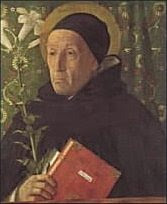 Meister Eckhart was a German Catholic monk (Dominican order) and mystic lived who lived between 1260 – 1328, some 700 years ago. I think he might be most famous for his sermon entitled “This is Meister Eckhart from whom God hid nothing”. Tried for heresy during the Inquisition, Meister Eckhart is a compelling figure who held to his convictions; all from an earlier time. Check him out for yourself in the available translations.